You'll be £4.99 closer to your next £10.00 credit when you purchase Classic Playground Games. What's this? A delightful book which records favourite childhood games and recalls forgotten rhymes. With more children suffering from obesity, Susan Brewer looks at the social games we used to play from skipping to chase games which used up our energy during break. Instead of costly computer games, we used rhyming games, played Jacks and showed our balancing skills during competitive games of hopscotch. A charming book, full of anecdotes and nostalgia for how we remember our favourite place at school - the playground. What I loved about this book were the songs and rhymes of childhood. I actually sang along to classic playground games such as London Bridge is Falling Down as I read it and it brought back so many happy memories. As well as the verses, there are also explanations of their meanings so you can discover just which church bells were ringing in Oranges and Lemons. 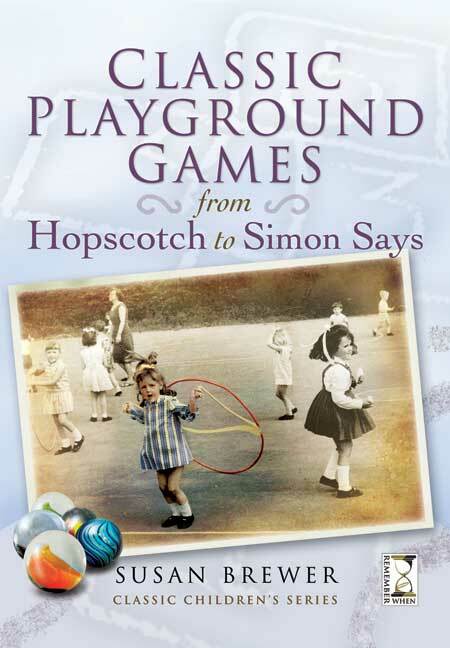 The combination of the history and meaning behind favourite playground games and the verses themselves make this a fantastic book and the explanations of now forgotten games such as hopscotch and various catch games will appeal to parents and grandparents - did you know that police were called when children scrawled gariffiti on the pavement because the caller didn't recognise the hopscotch grid! This book is virtually guaranteed to make you laugh and sing, I know I did. Susan is a renowned collectables author and columnist and lives in Harlow, Essex. She grew up in Welwyn Garden City.